The origin of angiosperms has been a long-standing botanical debate. The great diversity of angiosperms in the Early Cretaceous makes the Jurassic a promising period in which to anticipate the origins of the angiosperms. 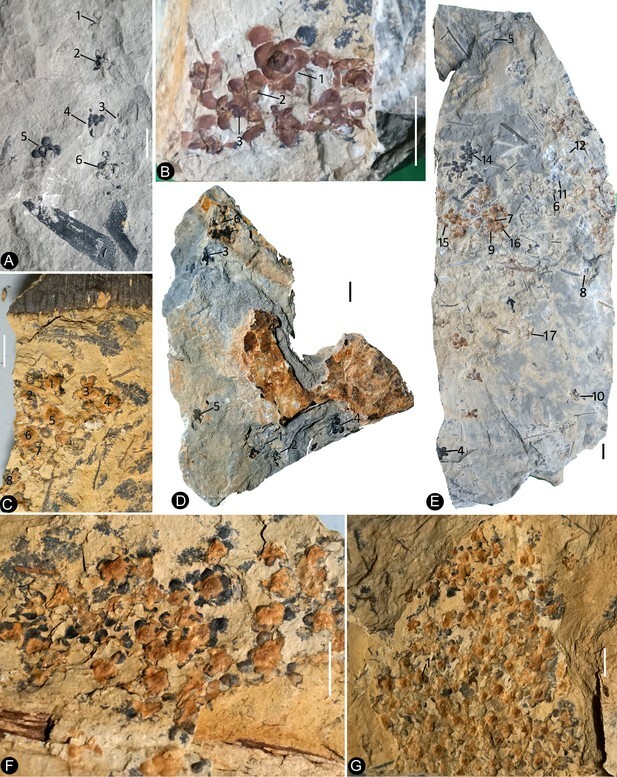 Here, based on observations of 264 specimens of 198 individual flowers preserved on 34 slabs in various states and orientations, from the South Xiangshan Formation (Early Jurassic) of China, we describe a fossil flower, Nanjinganthus dendrostyla gen. et sp. nov.. The large number of specimens and various preservations allow for an evidence-based reconstruction of the flower. From the evidence of the combination of an invaginated receptacle and ovarian roof, we infer that the seeds of Nanjinganthus were completely enclosed. Evidence of an actinomorphic flower with a dendroid style, cup-form receptacle, and angiospermy, is consistent with Nanjinganthus being a bona fide angiosperm from the Jurassic, an inference that we hope will re-invigorate research into angiosperm origins. From oranges to apples, flowering plants produce most of the fruits and vegetables that we can see on display in a supermarket. While we may take little notice of the poppy fields and plum blossoms around us, how flowers came to be has been an intensely debated mystery. The current understanding, which is mainly based on previously available fossils, is that flowers appeared about 125 million years ago in the Cretaceous, an era during which many insects such as bees also emerged. But not everybody agrees that this is the case. Genetic analyses, for example, suggest that flowering plants are much more ancient. Another intriguing element is that flowers seemed to have arisen during the Cretaceous ‘out of nowhere’. Fossils are essential to help settle the debate but it takes diligence and luck to find something as fragile as a flower preserved in rocks for millions of years. In addition, digging out what could look like a bloom is not enough. It is only if the ovules (the cells that will become seeds when fertilized) of the plant are completely enclosed inside the ovary before pollination that researchers can definitely say that they have found a ‘true’ flower. Now, Fu et al. describe over 200 specimens of a new fossil flower that presents this characteristic, as well as other distinctive features such as petals and sepals – the leaf-like parts that protect a flower bud. Called Nanjinganthus, the plant dates back to more than 174 million years ago, making it the oldest known record of a ‘true’ flower by almost 50 million years. Contrary to mainstream belief, this would place the apparition of flowering plants to the Early Jurassic, the period that saw dinosaurs dominating the planet. This discovery may reshape our current understanding of the evolution of flowers. Despite the importance of, the great interest in and intensive effort spent on investigating angiosperms, a controversy remains as to when and how this group came into existence. Since the time of Darwin, some scholars have proposed that angiosperms existed before the Cretaceous (Smith et al., 2010; Clarke et al., 2011; Zeng et al., 2014; Buggs, 2017), although the conclusion ‘there are no reliable records of angiosperms from pre-Cretaceous rocks’ made almost 60 years (Scott et al., 1960) seemed to be recently re-confirmed (Herendeen et al., 2017). Such uncertainty makes answers to many questions about the phylogeny and systematics of angiosperms tentative. Some reports of early angiosperms (i.e., Monetianthus (Friis et al., 2001)) are based on a single specimen, which restricts further testing and confirming. Better and more specimens of early age and with features unique to angiosperms are highly sought-after to test related evolutionary hypotheses. Here, we report an unusual actinomorphic flower, Nanjinganthus gen. nov., from the Lower Jurassic based on the observations of 264 specimens of 198 individual flowers on 34 slabs preserved in various orientations and states (Supplementary file 1). The abundance of specimens allowed us to dissect some of them, thus demonstrate and recognize a cup-form receptacle, ovarian roof, and enclosed ovules/seeds in Nanjinganthus. These features are consistent with the inference that Nanjinganthus is an angiosperm. The origin of angiosperms has long been an academic ‘headache’ for many botanists, and we think that Nanjinganthus will shed a new light on this subject. Flowers subtended by bracts. Bracts fused basally. Flowers pedicellate, actinomorphic, epigynous, with inferior ovary. Sepals 4–5, rounded in shape, each with usually 4–6 longitudinal ribs in the center and two lateral rib-free laminar areas, attached to the receptacle rim with their whole bases, surrounding the petals when immature, with epidermal cells with straight cell walls. Petals 4–5, cuneate, concave, each with usually 5–6 longitudinal ribs in the center and two lateral rib-free laminar areas, with rounded tips, surrounding the gynoecium when immature, with epidermal cells with straight cell walls. Gynoecium in the center, unilocular, fully closed by a cup-form receptacle from the bottom as well as sides and by an integral ovarian roof from the above. Style centrally attached on the top of the ovarian roof, dendroid-formed. One to three seeds inside the ovary, elongated oval, hanged on the ovarian wall by a thin funiculus, with the micropyle-like depression almost opposite the chalaza. Nanjinganthus dendrostyla gen. et sp. nov.
Nanjing- for Nanjing, the city where the specimens were discovered, and -anthos for ‘flower’ in Latin. Wugui Hill, Sheshan Town, Qixia District, Nanjing, China (N32˚08″ 19′ , E118˚58″ 20′) (Figure 1—figure supplement 1). The South Xiangshan Formation, the Lower Jurassic. the same as the genus. The flowers are frequently concentrated and preserved in groups on certain bedding surfaces (Figures 1a–g and 2a–b), although many of them are preserved as isolated individuals on other slabs. A flower bud is preserved as a coalified compression, 6.4 mm long and 3 mm wide, with characteristic longitudinal ribs on the sepals and petals (Figure 2g). The sepals are estimated to be 1.3–2.2 mm long and approximately 1.8 mm wide (Figure 2g). The petals (including the eclipsed portion) are estimated to be approximately 3.7 mm long (Figure 2g). The receptacle/ovary is approximately 3 mm in diameter (Figure 2g). The flowers are preserved in various states (including coalification), with cup-form receptacle, epigynous with an inferior ovary, 8.4–10.7 mm in length and 6.8–12.8 mm in diameter, actinomorphic in the bottom and top views (Figures 1a-g, 2a-f,h, 3a-b,d-f, 4a-b,d,g, 5e-i, 6a,f,j,l and 7a,e). The pedicel is approximately 0.76 mm in diameter (Figure 6a,b). Basally fused bracts 0.7–3.7 mm long are observed at the bottom in a few flowers, and a stoma is seen on a bract (Figures 4g-h, 7e,h, and 8h). The receptacle is cup-form, 3–4.8 mm in diameter and 2–4.5 mm high, surrounded by a 0.3 mm thick wall in the bottom and sides, and covered by an ovarian roof from the above (Figures 2h–i, 4d, 5h, 6a–b and 7a,e–f,i). Scales are attached on the sides of the receptacle/ovary (Figures 3a–b, 4a,g–h, 5i and 7a,e,i). The sepals are 1.7–3 mm long and 2.7–4.3 mm wide, with two lateral rib-free laminar areas and usually four longitudinal ribs in the center, and attached to the receptacle rim with their whole bases (Figures 2c-f, 3d-f, 4a,b,d-e, 5i,l, 6l, 7e,i, 9a). The elongated epidermal cells are, 44–156 μm x 33–54 μm, with straight cell walls in the middle region, while isodiametric epidermal cells 16–71 μm x 10–54 μm are seen in the lateral laminar areas of the sepals (Figures 8g, 9h-k and 10d-f). The petals are 3.1–6.6 mm long, 1.9–5.4 mm wide, compressed to only about 11 μm thick, with two lateral rib-free laminar areas, a cuneate base, and 5–6 longitudinal ribs in the center, located inside the sepals on the rim of the receptacle (Figures 2c–f,h,j,4a,b,d,6a,f,7a,e,i,8a–f,9a–g). 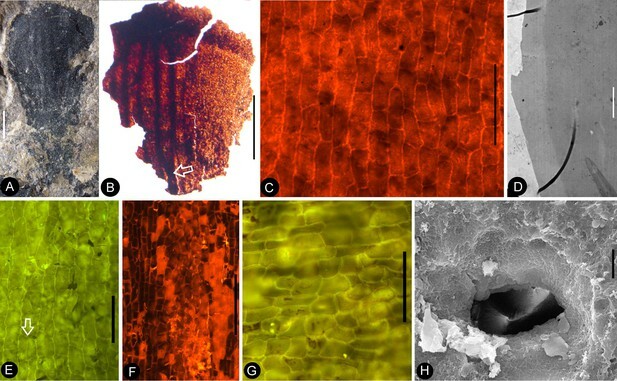 The ribs are approximately 0.12 mm wide, forking only basally, with elongated epidermal cells with straight cell walls, 32–144 μm x 17–30 μm on the abaxial and 19–72 μm x 13–29 μm on the adaxial (Figures 8a-f, 10a-b). The lateral laminar areas are free of ribs, and each is approximately 1.2 mm wide, with isodiametric epidermal cells 23–64 μm x 18–37 μm (Figures 8e, 9g). A possibly immature stoma is seen on one of the petals (Figure 10c). An unknown organ (staminode?) is seen once on the rim of the receptacle (Figure 6a,m). The ovarian roof is horizontal, with smooth integral outer and inner surfaces, 0.14–0.22 mm thick, with a style vertically located on its center (Figures 4c, 5h, 6f and 7a–c,e–g). The style is 0.3–0.8 mm in diameter, with lateral branches that make the width of the style 3–6 mm (Figures 2h–i, 3a–b, 5i–j, 6a,c and 7a–d). The basalmost pair of the lateral branches appear oppositely arranged along the style (Figures 2h and 3b) while the upper ones appear irregularly arranged (Figures 2i, 6a and 7c–d). There are longitudinal faint striations on the surface of the style (Figures 3c and 5j). There are 1.6–3.6 mm long and 1.7–2.2 mm wide round-triangular scales on the sides of the ovary (Figures 2g, 3b, 4a,g–h and 5i). Each ovary contains one to three seeds that are 0.65–3 mm x 0.5–1.7 mm, elongated or oval-shaped (Figures 2f, 5a,c and 6d,f–l), hanged on the inner wall of the ovary by a 0.08–0.27 mm wide funiculus (Figures 5e and 6d–e). A micropyle-like depression 0.15 × 0.36 mm is seen on a seed (Figure 5a,d). All bars are 1 cm long. (A) Six flowers (1-6) on the same slab, and an associated triangular leaflet with parallel venation. PB22227. (B) Several flowers on the same slab. 1–3 are shown in detail in Figures 2f and 6d,e. PB22226. (C) Several flowers (1-8) on the same slab and the associated Nilssonia parabrevis (top). PB22220. (D) Several flowers (1-6) on the same slab. 1–3 are shown in detail in Figures 2h and 3a–c. PB22224. (E) Many flowers on the same slab. Some of the numbered ones are shown in detail in later figures. PB22222a. (F) A slab with numerous flowers. PB22221. (G) A slab almost fully covered with flowers. PB22228. Flowers of Nanjinganthus preserved in different states and their details. Bar = 1 mm except otherwise annotated. (A) Numerous flowers preserved on a single slab. Some of the numbered ones are detailed in later figures. PB22222B. Bar = 1 cm. (B) Numerous coalified flowers on the same slab. Some of the numbered ones are detailed in Figure 3d–e. PB22223. Bar = 1 cm. (C) Bottom view of Flower 1 in Figure 2a, showing five sepals (s) and five petals (p) with longitudinal ribs. PB22222B. (D) Bottom view of Flower 2 in Figure 2a, showing four sepals (s) and four petals (p) with longitudinal ribs. PB22222B. (E) Bottom view of the flower in Figure 3f, showing a sepal (s) and three petals (p) radiating from the center, which is obliquely broken to show the relationship among the sepals and petals as in Figure 2j. PB22278. (F) Top view of Flower 1 in Figure 1b with sepals (s), petals (p), and seeds (arrow, enlarged in Figure 6h) inside the receptacle. PB22226. (G) Side view of a flower bud (Flower 1 in Figure 2b) with longitudinal ribs (arrows) on the sepals (s) and petals (p). PB22223. (H) Side view of Flower 1 in Figure 1d, showing a receptacle (h), perianth (black arrows), and a dendroid style (white arrow). PB22224. (I) Side view of Flower 15 in Figure 1e, without sepals or petals. PB22222a. Bar = 1 mm. (J) Detailed view of the flower shown in Figure 2e, showing the arrangement of three petal bases (1-3) inside the sepals (s). These petals bases correspond to the three petals (1-3) in Figure 2e. PB22278. Bar = 1 mm except otherwise annotated. (A–C, PB22224) (A) Flower 2 in Figure 1d (before the dégagement), showing the petal (1) and style (2) still embedded in the sediments. (B The same flower as in Figure 3a, after dégagement, showing the exposed dendroid style (white arrow) and petal (1), and the scale (sc) on the side of receptacle. (C) Detailed view of the style shown in Figure 3b with faint striations (arrows). Bar = 0.5 mm. (D–E) Flower 2 in Figure 2b after and before the organic material of the sepals (white arrows) and petals (black arrows) were removed for cuticle analysis. PB22223. (F) Bottom view of a flower before processing. Internal details are shown in Figure 2e,j. PB22278. Nanjinganthus flowers preserved in various orientations and states. Bar = 1 mm except otherwise annotated. (A) An oblique longitudinally split flower (Flower 11 in Figure 1e) with scales (sc), sepals (s), and petals (p). PB22222a. (B) A longitudinally split flower (Flower 12 in Figure 1e) with sepals (s) and petals (p). PB22222a. (C) Integral surface of an ovarian roof with a scar (arrow) left by a broken off style, from the flower shown in Figure 5h. PB22279. Bar = 0.5 mm. (D) Bottom view of a flower (Flower 14 in Figure 1e) with three sepals (s) and five petals (p) visible. PB22222a. (E) One of the sepals in Figure 4d, showing longitudinal ribs forking (arrow). PB22222a. (F) One of the petals in Figure 4d, showing longitudinal ribs. PB22222a. (G) Side view of a flower, showing scales (sc) on the ovary side and connate bracts (b) at the bottom. PB22229. (H) Detailed view of the connate bracts (b) and scales (sc) in Figure 4g. Note the outline (white line) of the fused bracts. PB22229. (I) The locule surrounded by the ovary wall (arrows) of the flower shown in Figure 4d. PB22222a. In situ seeds and flowers. Bar = 1 mm except otherwise annotated. (A) A seed (outlined) inside the ovary of Flower 16 in Figure 1e. Note the oboval micropyle (black arrow) and funiculus (white arrow). PB22222a. Bar = 0.2 mm. (B) Detailed view of the funiculus (between the arrows) of the seed in Figure 5a. PB22222a. Bar = 0.1 mm. (C) A seed (detailed in Figure 6i) inside the ovary of Flower 7 in Figure 1e. PB22222a. (D) Detailed view of the oval micropyle (arrows) of the seed in Figure 5a. PB22222a. Bar = 0.1 mm. (E) A seed (arrow, detailed in Figure 6d–e) inside the receptacle in Flower two in Figure 1b. PB22226. (F, G) Two facing parts of the same flower (Flower 10 in Figure 1e). PB22222a. (H) Top view of a flower with organically-preserved sepals (s), petals (p) and integral ovarian roof (fr), which is detailed in Figure 4c. PB22279. (I) Side view of a longitudinally split flower with scales (sc) on ovary side, sepals (s), petals (p) and partially preserved style (arrow). PB22489. (J) Detailed view of basal portion of the style (between arrows) arrowed in Figure 5i, with faint longitudinal striations. PB22489. Bar = 0.2 mm. (K) Detailed view of the narrowing base (between arrows) of the right petal in Figure 5i. PB22489. Bar = 0.5 mm. ( L) Detailed view of a sepal in Figure 5i. PB22489. Bar = 0.2 mm. Dendroid style, in situ seeds, and details of flowers. PB22222a, Bar = 1 mm except otherwise annotated. (A) A longitudinally split flower (counterpart of Flower 10 in Figure 1e, the same as in Figure 5f–g) showing the sepal (s) and petals (p), style base (white arrow), and an unknown organ (black arrow). (B) Detailed view showing the pedicel (lower arrow) terminating at the bottom of the ovary in Figure 6a. Note the level of ovarian roof (upper arrow). Bar = 0.5 mm. (C) Detailed view of the basal portion of the style marked by white arrow in Figure 6a. Bar = 0.5 mm. (D) A seed (white line) hanging by its funiculus (between arrows) on the ovarian wall of the Flower 2 in Figure 1b. PB22226. Bar = 0.5 mm. (E) Detailed view of the funiculus (between arrows) of the seed in Figure 6d. PB22226. Bar = 0.1 mm. ( F) Top view of Flower 8 in Figure 1e with sepals and petals surrounding the ovary containing two seeds (s). Note the residue (arrows) of the ovarian roof. (G) Detailed view of one of the oval seeds (s) inside the ovary in Figure 6f. Bar = 0.2 mm. (H) Two seeds (white line), one overlapping the other, inside the ovary shown in Figure 2f. PB22226. Bar = 0.2 mm. (I) An oval seed (white line) inside the ovary of Flower 7 in Figure 1e. Bar = 0.2 mm. (J) Detailed view of Flower 1 in Figure 1g, showing seeds within ovary. PB22228. (K) Detailed view of three seeds (1-3) inside the ovary of the flower shown in Figure 6j. PB22228. Bar = 0.5 mm. (L) Top view of a flower showing petals (p), sepal (sp), seed (s) visible under the ovarian roof (fr). PB22222d. (M) Detailed view of the unknown organ (staminode?) marked by the black arrow in Figure 6a. Bar = 0.5 mm. The flowers and their internal details. (A-C) (E-I) stereomicroscopy; (D), micro-CL. Bar = 1 mm except otherwise annotated. (A) A flower carefully dégaged to expose the details of the gynoecium. Note the petals (p) and a style (arrow) in the center. PB22282. (B) Detailed view of the style in Figure 7a, showing its connection (arrows) to the ovarian roof (fr). PB22282. Bar = 0.5 mm. (C) Distal portion of the same style as in Figure 7b, showing its connection with the ovarian roof (fr) and dendroid form with lateral branches (arrows). PB22282. Bar = 0.5 mm. (D) Micro-CL slice 1169 showing a perianth element (black arrow) and branches (white arrows) of the style, embedded in sediments and thus invisible to naked eyes, of Flower 4 in Figure 1e. PB22222a. (E–I) PB22281. (E) Side view of an organically-preserved flower with sepals (s) and petals (p). Note the dark organic material in the ovary (o) and some sepals. The foreground portion of the receptacle has been removed (compare with Figure 7i), to show the details in Figure 7f–h. (F) Detailed view of the receptacle/ovary in Figure 7e. Note the ovarian roof (fr) preventing the outside (above) sediment (yellow color) from entering the ovarian locule. Bar = 0.2 mm. (G) Detailed view of the solid organically-preserved ovarian roof (fr) with integral outer (upper arrow) and inner (lower arrow) surfaces. Bar = 0.1 mm. (H) Bottom portion of the flower in Figure 7i, showing subtending bracts (br, arrows). Bar = 0.5 mm. (I) The flower in Figure 7e, before removing the foreground portion of the ovary. Details of the sepal and petal. (A-B) stereomicroscopy; (C) (E-G) fluorescence light microscopy; (D) TEM; (H) SEM. Bar = 1 mm except otherwise annotated. (A) A petal with a narrowing base. PB22280. (B) A partial petal from the Flower in Figure 3d–e, with the longitudinal rib (to the left) forking at the base (arrow) and the rib-free laminar area to the right. PB22223. (C) Elongated epidermal cells of the petal in Figure 8b . PB22223. Bar = 0.1 mm. (D) Transmission electron microscope view showing the cuticle (left, light color) of a petal. PB22223. Bar = 2 μm. (E) Elongated epidermal cells not in strict longitudinal files in the laminar portion of the petal in Figure 8b . Note the two newly formed epidermal cells (arrow). PB22223. Bar = 0.1 mm. (F) Ribs with elongated epidermal cells (left and right) alternating the between region with less elongated cells (middle) of the petal in Figure 8b . PB22223. Bar = 0.2 mm. (G Elongated (above) and isodiametric (below) epidermal cells on the sepal of Flower in Figure 3d–e. PB22223. Bar = 0.1 mm. (H) A stoma on the bract of the flower (marked by white arrow in Figure 2h). PB22224. Bar = 5 μm. Petal and details of Nanjinganthus. (A-C) light stereomicroscopy; (D) (H) SEM; (E-G) (I-K) fluorescence light microscopy. PB22223. Bar = 1 mm except otherwise annotated. (A) Side view of Flower 3 in Figure 2b, showing the arrangement of the petals (p) and sepal (s). (B) The same flower as in Figure 9a. Note that some organic material of the petal has been removed for detailed observation. (C). Margins (arrows) of the petal (p) with cuneate base and their relationship to the sepal (s). (D) The petal removed from Figure 9a. SEM. Bar = 0.5 mm. (E) Cellular details of the petal in Figure 9d Bar = 0.5 mm. (F) Elongated epidermal cells arranged in files, enlarged from Figure 9e. Bar = 0.2 mm. (G) Isodiametric epidermal cells in the laminar area portion of the petal in Figure 9e. Bar = 0.1 mm. (H) A fragment of the sepal seen in Figure 9a. Bar = 0.5 mm. (I) Cellular details of the sepal in Figure 9h. Bar = 0.2 mm. (J) Elongated epidermal cells arranged in files on the sepal in Figure 9i. Bar = 0.1 mm. (K) Isodiametric epidermal cells on the laminar area of the sepal in Figure 9a. Bar = 0.1 mm. A, D-E, Fluorescence light microscopy; B-C, F, SEM. PB22223. 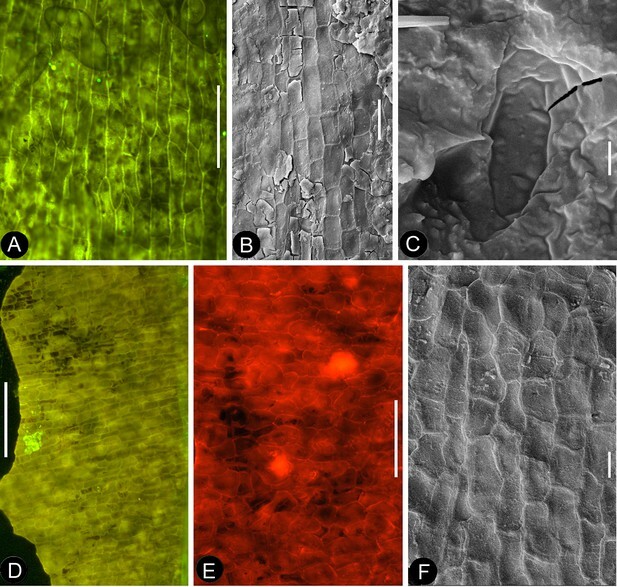 (A) Elongated epidermal cells in longitudinal files in the middle portion of the petal in Figure 8b. Bar = 0.1 mm. (B) Elongated epidermal cells on the rib of the petal in Figure 8b. Bar = 50 μm. (C) A possible stoma on the petal shown in Figure 8b. Bar = 2 μm. (D) Elongated epidermal cells in files on the sepal of flower in Figure 3d–e. Bar = 0.2 mm. (E) Isodiametric epidermal cells on the sepal of flower in Figure 3d–e. Bar = 0.1 mm. (F) Isodiametric epidermal cells on the sepal of flower in Figure 3d–e. Bar = 20 μm. Figure 6a,f (PB22222a), Figure 7e–i (PB22281), Figure 5h (PB22279). PB22222-PB22229, PB22236, PB22238, PB22241-PB22243, PB22245-PB22247, PB22256-PB22260, PB22278-PB22282, PB22489. dendrostyla, for ‘tree-like’ (dendri-) and ‘style’ (-stylus) in Latin. The receptacle is ‘the axis of a flower on which the perianth, androecium and gynoecium are borne’ (Stevens, 2018). This is the definition followed here. The important characteristic of the receptacle in Nanjinganthus is its cup form, a form frequently seen in more derived angiosperms according to the APG system. A dendroid style is seen in ten flowers (four in PB22224, Figures 2h and 3a–b; four in PB2222a, Figures 2i, 5f–g, 6a and 7d; one in PB22282, Figure 7a–c; one in PB22489, Figure 5i–j). The repeated occurrences of such an unexpected feature in the specimens of Nanjinganthus underscore its truthful existence. The dendroid-form distal portion of the gynoecium may be branched stigmas in Nanjinganthus. But it is possible that these lateral appendages on the style are actually pollen sac complexes, as are similarly attached on the style in extant Malvaceae (Judd et al., 1999). We have performed a meticulous fluorescence microscopic examination of this structure and found no trace of pollen grains, reducing the possibility that these lateral branches are clusters of pollen sacs, which is the case seen in some angiosperms (Malvaceae). A branched distal projection is apparently lacking in all known gymnosperms, but it has been seen some derived angiosperms, such as Passifloraceae, Poaceae and Euphorbiaceae (Heywood, 1978). One of the advantages of a branched style is the increased receptive area, which is conducive to anemophilous pollination. The occurrence of such feature in Nanjinganthus might suggest that Nanjinganthus had yet not established a close cooperation with animals (insects). However, it is noteworthy that this feature is not seen among extant basal angiosperms sensu APG (Chase et al., 2016). Considering the extremely early age of Nanjinganthus, we refrain from correlating Nanjinganthus with assumed derived taxa (Malvaceae and Rosaceae). We hope the future research may shed more light the nature of this part of Nanjinganthus. We have not seen any trace of the carpels typical of Magnoliales, which were previously believed by some to represent ancestral angiosperms. The seeds are physically enclosed by the cup-form receptacle and ovarian roof in Nanjinganthus. This constitutes the foundation based on which we justify our interpretation of Nanjinganthus as an angiosperm. The lack of carpel typical of Magnoliales cannot prevent Nanjinganthus from being an angiosperm as many angiosperms are actually ‘acarpellate’ (Heads, 1984; Sattler and Lacroix, 1988). It is noteworthy that, at least in some of basal angiosperms such as Nymphaea (Nymphaeales) (Taylor, 1991; Taylor, 1996) and derived angiosperms such as Cactaceae (Boke, 1964), the ovary is inferior and the seeds are attached to the ovarian walls. Whether the ovaries in these taxa share similar derivation pathway is a question worthy of further investigation. Four terms are used to describe the foliar parts in Nanjinganthus, namely, bract, scale, sepal, and petal. These terms are used according to the following demarcations and definitions. Bracts designate the foliar parts subtending the ovary. The scales are the foliar parts attached to the sides of the ovary. The sepals are those foliar parts attached to the rim of the receptacle with their whole bases. And the petals are foliar parts with narrowing bases attached to the receptacle rim and inside the sepals. Similar occurrence of bracts, sepals and petals is seen in some extant flowers (Figure 5—figure supplement 1). The enclosure of the seeds is fulfilled by the cup-form receptacle from the bottom and the structure here-called ‘ovarian roof’ (preserved complete in Figures 4c, 5h and 7e–g, but partially preserved in Figures 2f, 5c and 6f,j,l) from the above. The intact ovarian roof is clearly seen in the side view (Figure 7f–g) and in surface view (Figures 4c and 5h), in the latter case the seeds inside ovary are fully eclipsed by the ovarian roof. The ovarian roof is partially lost in Figure 6l, in which a central portion of the ovarian roof broke off revealing one of the seeds inside the ovary. The ovarian roof is almost completely lost (but still with some of its residue) in Figure 6f, and finally fully lost in Figures 2f and 6j–k, in which the seeds are plainly visible. This series of varying preservation status of ovarian roof suggests that the ovarian roof has fully enclosed the ovules in its original status, and the loss of ovarian roof and exposure of seeds are artifacts due to preservation. We cannot recognize the maturity of the ovules/seeds in Nanjinganthus, the length about 1 mm suggests that they are most likely to be seeds rather than ovules, therefore we prefer to use the term ‘seed’ rather ‘ovule’ throughout this paper. The number of seeds in Nanjinganthus is variable. According to our observation, it may be one (not shown), two (Figure 6f–i), or even three (Figure 6j–k). The Mesozoic was an age of gymnosperms, so the Jurassic age of Nanjinganthus makes it necessary to compare Nanjinganthus with common fossil gymnosperms frequently seen in the Mesozoic first. The potential candidates for Nanjinganthus include Caytoniales, Corystospermales, Ginkgoales, Czekanowskiales, Coniferales, Iraniales, Pentoxyales, Bennettitales, and Gnetales. Caytonia is a very intriguing fossil plant that has been frequently compared with angiosperms (Thomas, 1925; Doyle, 2006). Regardless of its ultimate gymnospermous affinity (Thomas, 1925; Harris, 1933; Harris, 1940; Nixon et al., 1994), Caytonia can be easily distinguished from Nanjinganthus by its cupule with an adaxial basal opening, bilateral reproductive organs, and lack of both a dendroid style and foliar appendages in its reproductive organs. Corystospermales is usually considered as a Mesozoic seed fern group, unlike Caytonia, the cupules in most Corystospermales open on the abaxial base and are rarely compared with angiosperms (Taylor et al., 2009). Corystospermales can be easily distinguished from Nanjinganthus by their cupule which has an abaxial basal opening, bilateral reproductive organs, and the lack of both a dendroid style and foliar appendages in the reproductive organs. Ginkgoales diversified greatly during the Mesozoic, and unlike extant Ginkgo, the Mesozoic relatives of Ginkgo are well represented by their reproductive organs, which are composed of seeds in clusters (Zhou and Zheng, 2003). Ginkgoales can be easily distinguished from Nanjinganthus by their clustered naked seeds, and lack of a dendroid style in the reproductive organs. Czekanowskiales are a unique group of fossil plants restricted to the Mesozoic. Their reproductive organs are bivalvate cupules containing two rows of seeds. Czekanowskiales can be easily distinguished from Nanjinganthus by their bivalvate cupules, bilateral reproductive organs, and lack of both a dendroid style and foliar appendages in the reproductive organs. Irania is the single genus of the Iraniales, which is assumed to have borne clusters of pollen sacs and fruits, from the Triassic-Jurassic (Schweitzer, 1977). Although no seeds have been observed in Irania, it is suspected to be an angiosperm. Its female and male parts are not concentrated on the same axis, and do not constitute a flower-like structure, and it is unknown whether the seeds are enclosed. These features distinguish Irania from Nanjinganthus. Pentoxylales are Mesozoic woody fossil plants characterized by a stem with five steles (Taylor et al., 2009). Their reproductive organs are cones with numerous naked orthotropous seeds helically arranged around the axes of their cones. Pentoxylales can be easily distinguished from Nanjinganthus by their cones which are devoid of any foliar appendages and the lack of a dendroid style. Bennettitales are important Mesozoic gymnosperms that are frequently related to angiosperms (Crane, 1985; Rothwell et al., 2009). Their reproductive organs are characterized by orthotropous ovules with micropylar tubes dispersed among interseminal scales, and these parts are helically arranged along the cone axis. Bennettitales can be easily distinguished from Nanjinganthus by their cones with ovules bearing micropylar tubes, and lack of a dendroid style (Taylor et al., 2009). Gnetales are important gymnosperms that diversified once in the Mesozoic, among which Gnetum has leaves that are difficult to distinguish from eudicots (Martens, 1971; Biswas and Johri, 1997). A characteristic feature of Gnetales is their decussate arrangement of leaves and cone parts. Like in Bennettitales, the reproductive organs of Gnetales are characterized by orthotropous ovules with micropylar tubes surrounded by scales. Like Bennettitales, Gnetales can be easily distinguished from Nanjinganthus by their cones with ovules with micropylar tubes and lack of a dendroid style. Besides the above comparison among female organs of seed plants, it is noteworthy that male cones in some conifers demonstrate a certain resemblance to Nanjinganthus, although such a comparison appears spurious when the presence of seeds in Nanjinganthus is taken into consideration. The bud-like Nanjinganthus (Figures 2g, 4a–b,g and 5i) appears similar to male cones of Microbiota decussata (a3 in Figure 2 of Schulz et al., 2014) and Thuja plicata (f2 in Figure 2 of Schulz et al., 2014). Mature Nanjinganthus (Figures 2h–i, 3a–b, 5f–g, 6a and 7a,e,i) appear like the male cone of Sequoia sempervirens, Taxus floridana, and Tsuga canadensis (e2, e5, f4, respectively, in Figure 2 of Schulz et al., 2014). The sporangiophores in these taxa are arranged around the cone axis and appear dendrioid, and the scales at the base appear like the sepals/petals in Nanjinganthus. But the cup-form receptacle with seeds inside plus the lack of pollen grains in the distal dendroid part distinguish Nanjinganthus from all these male cones. As in female cones, these male cones also have cone axes penetrating the cones from the bottom to the tip and thus are different from Nanjinganthus in which the pedicel stops at the bottom of the organ (ovary) (Figure 6b) and the style starts above the ovarian roof (Figure 4c, 5h, 6a-c, 7a-c). In addition, the spatial distribution and furcation of the vascular bundles in the sepals and petals of Nanjinganthus (Figures 2c–d,4e–f,9a–b) are distinct from those seen in bracts and scales in coniferous cones. From the above comparison, we infer that none of the known gymnosperms, fossil or extant, are comparable to Nanjinganthus. The enclosed seeds distinguish Nanjinganthus from gymnosperms, which are not supposed to enclose their ovules in such a way (Table 1). Comparison between Nanjinganthus and Mesozoic gymnosperms. Symmetry Radial Bilateral Radial Bilateral Radial Radial Radial? Bilateral Radial? Opening in female part No Adaxial basal Terminal? Adaxial basal N/A N/A ? Distal slit ? There are several reports of Jurassic angiosperms, including Schmeissneria (Wang et al., 2007), Xingxueanthus (Wang and Wang, 2010), Juraherba (Han et al., 2016), and Euanthus (Liu and Wang, 2016). These genera are from the Middle-Late Jurassic of northeastern China. The cup-form receptacle, inferior ovary, and dendroid style distinguish Nanjinganthus from all these Jurassic peers, and justify Nanjinganthus as a new genus of angiosperm. Although multiple characters have been suggested to identify fossil angiosperms (Herendeen et al., 2017), angio-ovuly before pollination is the key character that distinguishes an angiosperm from other seed plants (Tomlinson and Takaso, 2002; Wang, 2010a; Wang, 2018). This criterion has been repeatedly applied to identify fossil angiosperms (i.e. 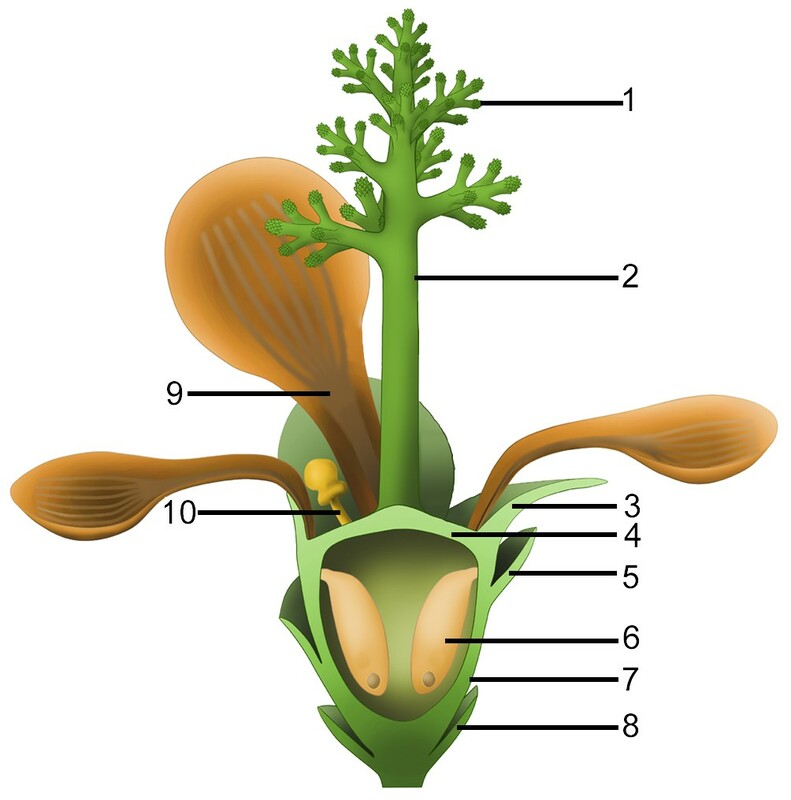 Archaefructus (Sun et al., 1998), which initially had no other features (stamen, venation, pollen grains) but enclosed seeds to support their angiospermous affinity). The integral ovarian roof of Nanjinganthus has no opening (Figures 4c and 5h). After burial, this ovarian roof can block the sediment from entering the ovarian locule (Figure 7e–g). That this space remained free of sediment suggests a full enclosure of the ovules/seeds, securing an angiospermous affinity for Nanjinganthus. The radial arrangement of two whorls of foliar parts (sepals and petals) in Nanjinganthus is very similar to those of flowers in extant angiosperms (Figures 1a–b and 2a–f), while the above comparison with known gymnosperms emphasizes that Nanjinganthus cannot be interpreted as a gymnosperm. Furthermore, Nanjinganthus satisfies all thirteen definitions of flowers advanced by various authors (Bateman et al., 2006). These features again are consistent with the angiospermous affinity of Nanjinganthus (Figure 11). There have been several suggested models of ancestral angiosperms (Arber and Parkin, 1907; Cronquist, 1988; Endress and Doyle, 2015; Sauquet et al., 2017). These models were drawn more or less after the assumed basalmost living angiosperms, either Magnolia or Amborella. The common features of these model plants include apocarpy, superior ovary, lack of obvious style, etc. However, these features are rarely seen in Nanjinganthus or other early angiosperms (Wang et al., 2007; Wang and Zheng, 2009; Wang, 2010b; Wang, 2018; Han et al., 2013; Han et al., 2016; Han et al., 2017; Liu and Wang, 2016; Liu and Wang, 2017; Liu et al., 2018; Liu and Wang, 2018). Instead, an inferior ovary, a feature unexpected by, at least, most theories of angiosperm evolution, is clearly seen in Nanjinganthus and quite many Early Cretaceous flowers (Friis, 1984; Friis, 1990; Friis et al., 2011). This discrepancy between fossil observation and theories suggests EITHER that inferences based on living plants have limited capability of ‘predicting’ past history, OR that angiosperms originated polyphyletically, each lineage has followed a different evolution route, and Nanjinganthus represents one of the many, OR that angiosperms have a history that dates back to a time much earlier than the Cretaceous, and Nanjinganthus is one of the many derived from such assumed ancestor, OR a combination of these. Whatever the implications are, the currently dominant theories of angiosperm evolution apparently need to be reassessed. 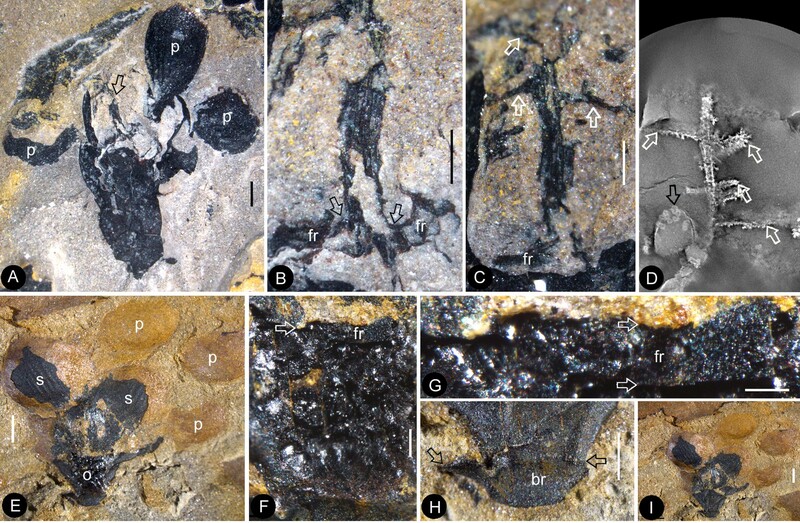 Most Nanjinganthus specimens are concentrated on certain bedding surfaces, and over 50 individual flowers are preserved on a single slab (Figures 1a–g and 2a–b), suggesting that Nanjinganthus may have flourished and dominated a particular niche, although Nanjinganthus played only an inferior role in the broader Jurassic ecosystem. The concentrated preservation of delicate flowers is more likely a result of autochthonous preservation, suggesting a habitat very close to water for Nanjinganthus. Various studies (including palaeobotany) on the South Xiangshan Formation in the last century (Hsieh, 1928; Li et al., 1935; Sze and Chow, 1962; Zhou and Li, 1980; Cao, 1982; Cao, 1998; Cao, 2000; Wang et al., 1982; Huang, 1983; Huang, 1988; Ju, 1987) and our palynological analysis as well as U/Pb dating (Figure 1—figure supplement 1; Supplementary file 2; Santos et al., 2018) suggest a latest Early Jurassic age for Nanjinganthus. Together with the ‘unexpectedly’ great diversity of angiosperms in the Early Cretaceous (Sun et al., 1998; Sun et al., 2001; Sun et al., 2002; Leng and Friis, 2003; Leng and Friis, 2006; Ji et al., 2004; Wang and Zheng, 2009; Wang and Zheng, 2012; Wang and Han, 2011; Han et al., 2013; Han et al., 2017; Wang, 2015; Liu et al., 2010a), pollen grains indistinguishable from angiosperms in the Triassic (Hochuli and Feist-Burkhardt, 2004; Hochuli and Feist-Burkhardt, 2013), a bisexual flower from the Jurassic (Liu and Wang, 2016), and an herbaceous angiosperm from the Middle Jurassic (Han et al., 2016), the unexpectedly early age of Poaceae (Prasad et al., 2011; Wu et al., 2018) and Solanaceae (Wilf et al., 2017), Nanjinganthus with over 200 specimens is consistent with a pre-Cretaceous origin of angiosperms. The systematic position of Nanjinganthus is now apparently open to further investigation, although it demonstrates a certain resemblance to Pentapetalae sensu (Judd et al., 2016). We cannot determine whether Nanjinganthus stands for a Jurassic stem group of angiosperms that started their radiation later in the Cretaceous or a lateral branch leading to an evolutionary dead end. It is premature to determine its phylogenetic position before more information of contemporaneous peers is available, although we welcome all phylogeneticists to evaluate Nanjinganthus in their own ways and perspectives. Nanjinganthus is recognized based on at least 198 individual flower fossils from the Early Jurassic that are preserved in various states and orientations. We infer that the seeds were enclosed by a cup-form receptacle and an ovarian roof, traits which suggest an angiospermous affinity for Nanjinganthus. It would be intriguing to figure out in future research whether Nanjinganthus represents a stem group, a group derived from more ancient ancestors, or an evolutionary dead end of polyphyletic angiosperms. We hope that the discovery of Nanjinganthus will re-invigorate research on the origin and early history of angiosperms. Initially, what is now known as the Xiangshan Group was called the ‘Nanking Sandstein’ that was put in the Upper Carboniferous by Richthofen (1912). Liu and Chao (1924) thought that the Nanking Sandstein belonged to the Jurassic and renamed it the ‘Tsung Shan Formation’. Hsieh (1928) subdivided the Tsungshan Formation into six units, namely, in ascending order, Huang Ma Ching Shale, Quartzitic Conglomerate, Tzu Hsia Tung Series, Lingkusssu Shale, Light Yellow Sandstone, Variegated Sandstone and Shale. Li et al. (1935) found fossil plants including Equisetites, Neocalamites, Cladophlebis, Otozamites, Pterophyllum, Dictyophyllum, Pagiophyllum, Baiera guilhaumatii, and Podozamites lanceolatus. They also changed the ‘Tsungshan Formation’ to ‘Xiangshan Layers’, and regarded its age as being the Early Jurassic. Sze and Chow (1962) used the term ‘Xiangshan Group’ for the previous ‘Xiangshan Layers’, and this has been the convention followed ever since. The age of the Xiangshan Group has been concluded by various authors to range from the Late Triassic to the Middle Jurassic. Ju (1987) divided the Xiangshan Group into a lower South Xiangshan Formation and an upper North Xiangshan Formation, respectively. The standard section of the lower part of the Xiangshan Group (the South Xiangshan Formation, the Lower Jurassic) is 394 meters thick in South Xiangshan in Nanjing, and has yielded abundant fossil plants. The standard section of the upper part of the Xiangshan Group (the North Xiangshan Formation, the Middle Jurassic) is in North Xiangshan in Nanjing. It is 1005 meters thick, and has only yielded a few stem fossils (Ju, 1987). Based on fossil plants, Cao (1982) thought that the age of the South Xiangshan Formation could not be later than the Early Jurassic, and considering that the early Early Jurassic flora (in the middle and lower parts of the Guanyintan Formation in southwest Hunan) (Zhou and Li, 1980) is biostratigraphically below the South Xiangshan Formation, Cao (1982) regarded the age of the lower part of Xiangshan Group (=South Xiangshan Formation) as the middle-late Early Jurassic. 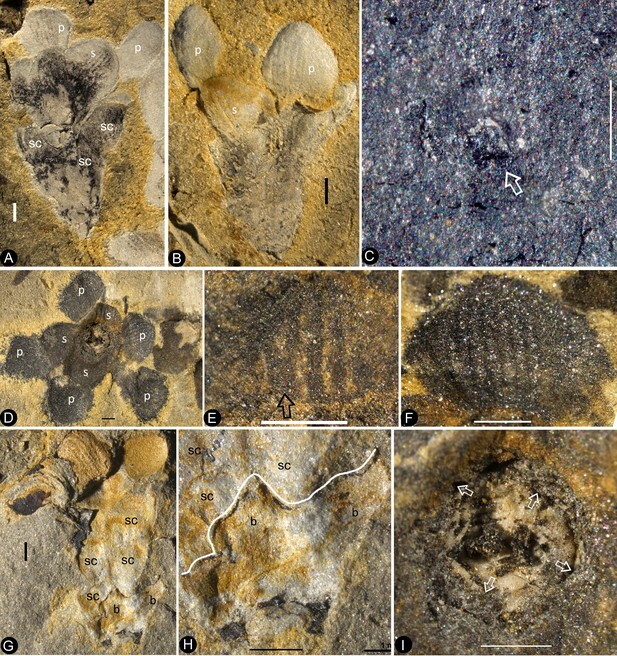 The South Xiangshan Formation (lower part of the Xiangshan Group) has yielded abundant bivalve and plant fossils. Its outcrops are scattered in Jiangning, Longtan, and Zhenjiang (all in the suburbs of Nanjing). In these areas, the outcrops are well exposed and especially fossiliferous near the South Xiangshan and Cangbomen regions. The formation includes sandstones, siltstones, shales, carbonaceous shales, and coal seams. 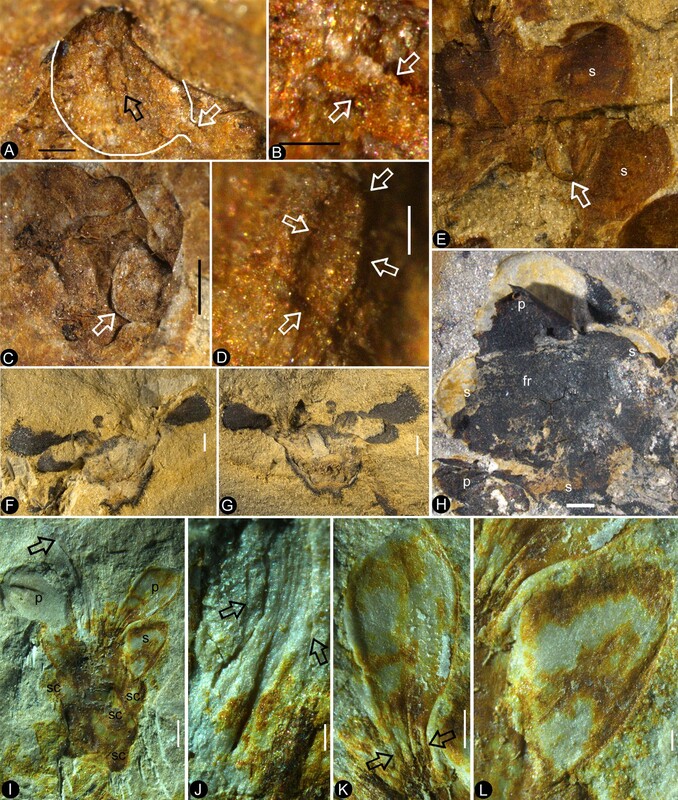 There are abundant plant fossils in the South Xiangshan Formation, and almost all of the plants in the Xiangshan Group are from this formation. Various authors have collected fossil plants of the Xiangshan Flora (Cao, 1982; Cao, 1998; Cao, 2000; Wang et al., 1982; Huang, 1983; Huang, 1988; Ju, 1987). According to Cao (1982), Cao (1998), Cao (2000), Wang et al. (1982), and Ju (1987), the Xiangshan Group includes at least 46 genera of plants and is very similar to the flora of the Hsiangchi Group in western Hubei. Cycadophytes (34%) dominate the flora, and ferns are the second most dominant group (20%), among which Dipteridaceae play an important role. Ginkgoales are also abundant (19%) (Ju, 1987). The important and frequently observed taxa include Hysterites, Selaginellites, Equisetites cf. lateralis, E. aff. multidentatus Oishi, E. sarrani (Zeiller) Halle, Neocalamites hoerensis (Schimper) Halle, N. dangyangensis Chen, Marattiopsis asiatica Kawasaki, M. hoerensis (Schimper) Schimper, Todites goeppertianus (Münster) Krasser, T. princeps (Presl) Gothan, Osmundopsis Harris, Cladophlebis denticulata (Brongniart) Fontaine, C. goeppertianus (Münster) Krasser, C. raciborskii Zeiller, Spiropteris Schimper, Phlebopteris polypodioides Brongniart, Danaeopsis Heer ex Schimper, Thaumatopteris pusilla (Nathorst) Oishi et Yamasita, Dictyophyllum nathorstii Zeiller, D. nilssonii (Brongniart) Goeppert, Clathropteris meniscioides Brongniart, Cl. platyphylla Goeppert, Cl. obovata Oishi, Coniopteris hymenophylloides (Brongniart) Seward, Thinnfeldia Ettingshausen, Augustiphyllum yaobuensis Huang, Scoresbya dentata Harris, Pterophyllum firmifolium Ye, Pt. propinquum Goeppert, Pt. subaequale Hartz, Nilssonia complicatis Li, N. orientalis Heer, N. minor Harris, N. cf. compta (Schenk) Ye, N. cf. polymorpha Schenk, N. pterophylloides Nathorst, N. cf. saighanensis Seward, N. taeniopterioides Halle, N. parabrevis Huang, N. moshanensis Huang, Nilssoniopteris vittata (Brongn.) Florin, Ctenis Lindley et Hutton, Ctenozamites cf. ptilozamioides Zhou, C. cf. cycadea (Berger) Schenk, Cycadolepis corrugata Zeiller, Anomozamites cf. minor Nathorst, A. cf. major (Brong) Huang, A. cf. inconstans (Goeppert) Schimper, A. quadratus Cao, Tyrmia nathorstii (Schenk) Yeh, T. latior Ye, T. lepida Huang, T. susongensis Cao, Otozamites minor Tsao, Ot. hsiangchiensis Sze, Ot. mixomorphus Ye, Ot. tangyanensis Sze, Ptilophyllum hsingshanense (Wu) Cao, Pt. contiguum Sze, Pt. pecten (Philips) Morris, Hsiangchiphyllum trinervis Sze, Ginkgoites cf. tasiakouensis Wu et Li, G. cf. sibiricus (Heer) Seward, G. cf. magnifolius Du Tiot, Baiera cf. furcata (L. et H.) Braun, B. asadai Yabe et Oishi, B. guilhaumatii Zeiller, B. multipartita Sze et Lee, B. cf. gracilis Bunbury, Sphenobaiera huangii (Sze) Hsu ex Li, S. spectabilis (Nath.) Florin, Czekanowskia rigida Heer, C. hartzii Harris, Phoenicopsis Heer, Ginkgodium Yokoyama, Desmiophyllum Lesquereux, Stenorachis (Nathorst) Saporta, Vittifoliolum multinerve Zhou, Pityophyllum longifolium (Nathorst) Möller, Podozamites lanceolatus (L. et H.) Braun, Ferganiella Prynada, Elatocladus Halle, Swedenborgia cryptomerioides Nathorst, Taeniopteris cf. richthofenii (Schenk) Sze, T. inouyei Tateiwa, Conites and Carpolithus (Figure 3—figure supplement 1; Figure 4—figure supplement 1). Preliminary analysis of the strata yielding Nanjinganthus has recognized abundant palynomorphs. The palynoflora includes Anapiculatisporites sp., Annulispora folliculosa (Rogalska) De Jersey, Contignisporites sp., Cyathidites australis Couper, C. minor Couper, Deltoidospora sp., D. minor Pocock, Dictyophyllidites harrisii Couper, D. mortonii (De Jersey) Playford and Dettmann, Gleicheniidites sp., G. senonicus Ross, Ischyosporites sp., I. variegatus (Couper) Schultz, Leptolepidites verrucatus Couper, Manumia delcourtii (Pocock) Dybkjær, Neoraistrickia ramosus (Balme and Hennelly) Hart, Osmundacidites wellmanii Couper, Polycingulatisporites triangularis (Bolchovitina) Playford and Dettmann, Punctatosporites sp., Retitriletes austroclavatidites (Cookson) Döring et al., R. clavatoides (Couper) Döring et al., Sestrosporites pseudoalveolatus (Couper) Dettmann, Striatella scanica (Nilsson) Filatoff and Price, S. seebergensis Mädler, Alisporites sp., A. robustus Nilsson, Callialasporites dampieri (Balme) Dev, C. minus (Tralau) Guy, C. trilobatus (Balme) Dev, C. turbatus (Balme) Schulz, Cerebropollenites macroverrucosus (Thiergart) Pocock, Chasmatosporites sp., C. apertus (Rogalska) Nilsson, C. hians Nilsson, Classopollis chateaunovi Reyre, C. classoides (Pflug) Pocock and Jansonius, C. meyeriana (Klaus) De Jersey, C. simplex (Danzé-Corsin and Laveine) Reiser and Williams, Cycadopites sp., C. follicularis Wilson and Webster, Ephedripites sp., Monosulcites sp., M. minimus Cookson, Perinopollenites elatoides Couper, Platysaccus sp., Podocarpidites sp., Quadraeculina anellaeformis Maljavkina, Q. enigmata (Couper) Xu and Zhang, Q. minor (Pocock) Xu and Zhang, Spheripollenites psilatus Couper, Vitreisporites pallidus Nilsson (Figure 2—figure supplement 1) (Santos et al., 2018). 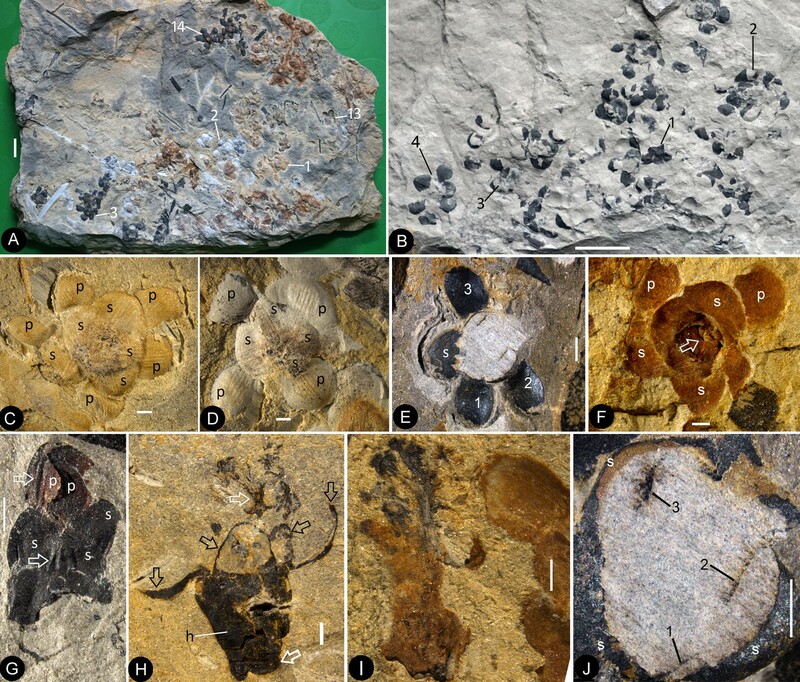 This palynological assemblage suggests a latest Early Jurassic age for Nanjinganthus. The samples were processed by crushing, initial heavy liquid and subsequent magnetic separation at Langfang Yuneng Rock Mineral Separation Technology Service Co., Ltd. in Langfang City. More than 1000 grains of zircons were hand-picked under a binocular microscope. More than 200 grains of representative zircons for each sample were coined in epoxy resin mounts, ground and polished to expose the central part of zircons, and then photographed under microscope in transmitting light and reflected light. Afterward, the internal structure of the zircons was studied by means of cathodoluminescence (CL) imaging at the Beijing Gaonianlinghang Technology Co., Ltd. in Beijing City. U-Pb dating of these samples were carried out using laser ablation multicollector inductively coupled plasma mass spectrometry (LA-MC-ICP-MS) at the Tianjin Institute of Geology and Mineral Resources. The laser beam was 35 μm in diameter. Concentrations of U, Th, and Pb elements were calibrated using SRM 610 as the external reference standard. For the analysis method please see refer Li et al., 2009. Repeated analyses of standards yielded precisions at better than 10% for most elements. 207Pb/206Pb, 206Pb/238U, 207Pb/235U and 208Pb/232Th ratios and apparent ages were calculated using ICPMSDataCal software (Liu et al., 2010a; Liu et al., 2010b) and corrected for both instrumental mass bias and depth dependent elemental and isotopic fractionation using zircon GJ-1 as the external standard. U-Pb age Concordia diagram and histograms apparent ages diagram were drawn by using ISOPLOT (ver.3) (Ludwig and Ludwig, 2003). There was no previous isotopic age for the Xiangshan Group. We sampled the layers above the fossiliferous layers (Figure 1—figure supplement 1) and picked zircon grains for U/Pb dating. The zircon grains appeared to be reworked (Supplementary file 2), with ages ranging from 2738 Ma to 207 Ma (67 zircon grains with the concordance >90% from 168 zircon grains), and 207 Ma (two zircon grains) is the youngest age (Figure 1—figure supplement 1). Most of the zircon grains were of magmatic origin with internal oscillation belts and high Th/U values, implying a granitic provenance. So the upper limit age of Nanjinganthus is 207 Ma (the Late Triassic). Taking all dating information into consideration, we think that the age of Nanjinganthus falls in the scope ranging from 174 to 207 Ma and is closer to 174 Ma (the latest Early Jurassic). Such a conclusion on absolute age of Nanjinganthus is in agreement with megafossil biostratigraphical analysis (Cao, 1982; Huang, 1983; Huang, 1988; Ju, 1987), although Neocalamites horridus was previously known only in the Late Triassic (Zan et al., 2012). The fossils studied here were collected from an outcrop of the South Xiangshan Formation at a quarry owned by the Xiaoyetian Cement Company Ltd. in the northeastern suburb of Nanjing, Jiangsu, China (N32˚08′ 19′′, E118˚58′ 20′′) (Figure 1—figure supplement 1). Plant fossils of the formation have been extensively studied by various scholars (Sze and Chow, 1962; Cao, 1982; Cao, 1998; Cao, 2000; Wang et al., 1982; Huang, 1983; Huang, 1988; Ju, 1987), and our collection from the local outcrop indicates that the fossil plants closely associated with Nanjinganthus constitute a flora dominated by Dipteridaceae (Clathropteris) and various cycadophytes (mainly Nilssonia, Ptilophyllum, and Pterophyllum), which is consistent with previous works. Some of these associated plant fossils are shown in Figure 3—figure supplement 1 and Figure 4—figure supplement 1. The specimens were initially photographed using a Sony ILCE-7 digital camera. 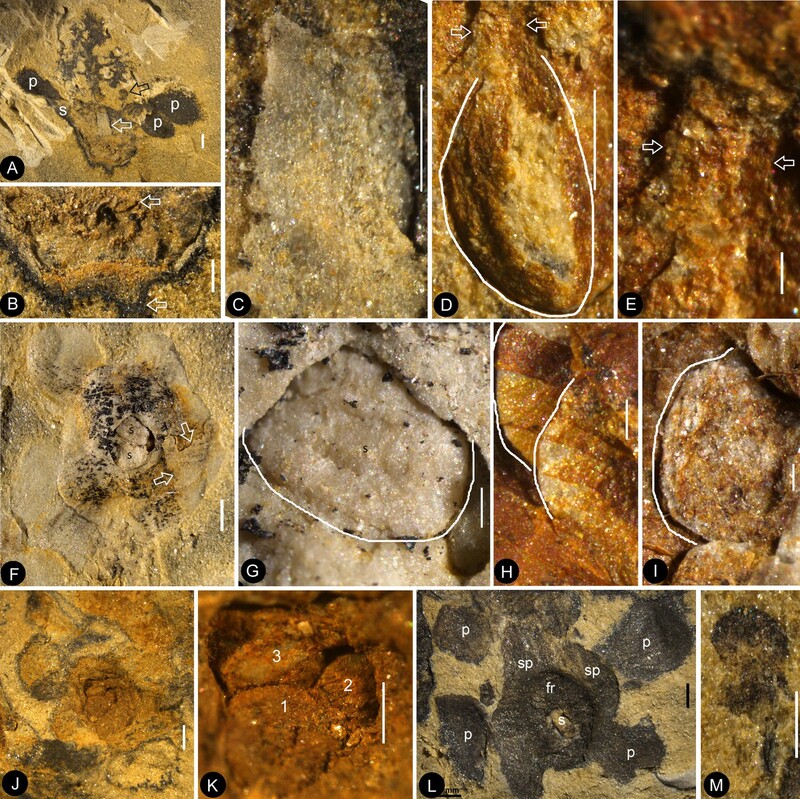 The sediment covering the specimens was dégaged using a JUN-AIR pneumatic drill, and the details of the fossils were observed and photographed using a Nikon SMZ1500 stereomicroscope equipped with a Digital Sight DS-Fi1 camera. Organically preserved sepals and petals were processed with 40% peroxide for cuticle analysis according to routine methods, and the processed cuticles and cleaned organic material of the sepals and petals were observed and photographed using the Rhod fluorescent light in a Zeiss Z2 Imager with an AxioCam HRc camera. Extended-focus images were generated using the Z-stack function in an AxioVs40 × 64 V4.9.1.0. The removed cuticles were coated with gold and observed using a Leo 1530 VP scanning electron microscope (SEM), and serial pictures were obtained after the internal details of the flower were exposed through grinding with a pneumatic drill. One of the organically-preserved petals was embedded in resin and sectioned for light microscopy and transmission electron microscopy (TEM). One fragment of the distal portion of a flower embedded in sediments was observed by Micro Computed Laminography (Micro-CL) (Wei et al., 2017) to show the dendroid style embedded in the sediments. All photographs were saved in TIFF format and assembled for publication using Photoshop 7.0. Journal of the Linnean Society of London, Botany 38:29–80. Journal of Experimental Botany 57:3471–3503. American Journal of Botany 51:598–610. Nature Ecology & Evolution 1:0169. Botanical Journal of the Linnean Society 181:1–20. Annals of the Missouri Botanical Garden 72:716–793. United Kingdom: Thomas Nelson & Sons Ltd. The Journal of the Torrey Botanical Society 133:169–209. Annals of the Missouri Botanical Garden 71:403–418. Frontiers in Plant Science 4:344. Bulletin of the Geological Society of China 7:139–156. Earth Science - Journal of Wuhan College of Geology 20:25–36. Bulletin of Nanjing Institute of Geology and Mineral Resources, Chinese Academy of Geological Sciences 8:33–44. Sunderland, MA: Sinauer Associate Inc.
Plant Systematics and Evolution 241:77–88. Plant Systematics and Evolution 262:173–187. Memoir of the Geological Survey of China 4:1–34. Earth and Environmental Science Transactions of the Royal Society of Edinburgh 54:1–10. User's manual for isoplot 3.00: , A Geochronological Toolkit for Microsoft Excel, Berkeley, Berkeley Geochronology Center Special Publication. Annals of the Missouri Botanical Garden 81:484–533. Nature Communications, 2, 10.1038/ncomms1482, 21934664. In: E Tiessen, editors. China. Ergebnisse Eigener Reisen Und Darauf Gegruendeter Studien, 3. Berlin: Verlag von Dietrich Reimer (Ernst Vohsen). pp. 395–753. American Journal of Botany 96:296–322. American Journal of Botany 75:918–927. American Journal of Plant Sciences 5:2842–2857. How old are the angiosperms? American Journal of Science 258-A:284–299. Shanghai: Shanghai Technology & Education Press. In: G Kirchner, LJ Taylor DWHickey, editors. Flowering Plant Origin, Evolution & Phylogeny. New York: Chapman. pp. 116–140. Philosophical Transactions of the Royal Society B: Biological Sciences 213:299–363. Canadian Journal of Botany 80:1250–1273. Journal of Integrative Plant Biology 51:800–811. Journal of Systematics and Evolution 48:326–335. Acta Geologica Sinica - English Edition 85:998–1002. Acta Geologica Sinica - English Edition 84:47–55. Review of Scientific Instruments 88:115107. Scientific Papers on Geology for International Exchange Prepared for the 26th International Geological Congress 4. Stratigraphy and Palaeontology. pp. 82–91. Thank you for submitting your work entitled "Nanjinganthus: An Unexpected Flower from the Jurassic of China" for consideration by eLife. Your article has been reviewed by three peer reviewers, including David Taylor as the Reviewing Editor and Reviewer #1, and the evaluation has been overseen by a Senior Editor. The following individual involved in review of your submission has agreed to reveal their identity: Hongqi Li (Reviewer #2). A further reviewer remains anonymous. The decision to reject this manuscript was difficult. The material is unique and provides a huge amount of data not normally available. Yet justification of such a new taxon requires a level of description that not only shows the characters, but also excludes the possibility of relationships to living and fossil seed plant groups. Below is a summary of problems based both on the reviews and discussions between the reviewers. We hope that they will form the basis of a revision that will allow the work to be improved and accepted for its value. Please note that additional details are discussed in the reviews. 1) Diagnosis should not include all of the description and concentrate on the unique, unequivocal characters. For example words such as "probably", "more or less" and "possible" do not have a place in a diagnosis. 2) There is not enough discussion of each organ explaining why it is as named and not something else. You do discuss but do not reference figures again. 3) Cross referencing of figures to other figures (Figure 2I is same as 3A-C). 4) Need specimen numbers so can easily refer to each other. 5) Is the carpel closed? The evidence of closed ovary, explanation why those appearing open are to be excluded, such as due to preservation. Must discuss those case figures where it looks open. The best demonstration of closed is the Figure 7A-C series, showing organic connection of "dendroid style". Figure 2H also appears to show it. 3I does say that it is broken. What about 4C and 5H? 6) What is the branched "dendroid style" structure? Must exclude other possibilities. Also, any cases of flowers with "dendroid style" also with seeds? E.g., "dendroid style" is quite similar to a mature pollen cone of Taxus (no mention of this in the manuscript). Need more on description. You only mention Figure 4 specimen with the "dendroid style": Flower 1 in Figure 1D shown in Figure 2H; Flower 2 in Figure 1D shown in Figure 2I, Figure 3A-C; Flower 10 in Figure 1E shown in 5GF, 6A-C; PB22282 shown in Figure 7A-B. It is weird, but based on those flowers, it is always centrally placed, has a naked portion at base, it projects past the bracteoid structures and connects in the same line, and first branches opposite to subopposite. It does not seem to project below the line between the attachment of the last bracteiod structures "petals". Could they be germinating seeds? 7) Are the sterile organs bracts/scales or perianth organs? Are the "ribs" really veins, and are they clearly different in each organ? Also, these seem to have a 2/5 phylotaxy, not a simple spiral. 8) Stamen details are need. Since only one found, and it does not have an ovary, probably should not assume bisexual. 9) Other evidence of expected angiosperm characters, e.g., pollen size and ornamentation, could strengthen case. These pollen grains are the expected size and ornamentation (based on Doyle's work and separately my work). Would be great to have ultrastructure which IS unique to angiosperms. 10) There are no good comparisons among these fossils and taxa that easily conforms with these fossils. If not angiosperm, then what? New group? 1) The fossil has as multiple angiosperm characters. If not then the additional characters must not be defining characteristics of other groups of living or fossil seed plants. 2) Age and dating of the sediment the fossil species is found is reliable, including that the fossils were collected by the authors so the placement and stratigraphy is reliable. 3) The characteristics are consistent with hypothesis of what the ancestral character states might be. These can by phylogenetic (synapomorphies) or conceptual. My review has been to carefully work through the figures and captions. I compliment the authors on a detailed captions and descriptions, and excellent use of arrows to describe what they see on the plates. There is no doubt of what the authors believe they are seeing, even if the reader disagrees with the interpretation. The biggest strength is the larger number of specimens with different types of preservation and the multiple views of the same organs. The abstract is strong. The description is also fine, although there a couple of mistakes where the referred figures are the wrong ones. The following is my evaluation of the three criteria. 1) Yes, including closed ovary, stigma and style, 4-parted anther, bisexual reproductive organ, anther with filament, alternate/spiral phylotaxy, low ovule/seed number, etc. They are correct that there is no other living of fossil group that has this suite of characters. 2) The biostratigraphy looks strong with both macrofossil and microfossil evidence. But they should explicitly say whether the megafossil evidence supports the age. The Ar40/Ar39 is nice but not overly conclusive. 3) This is the weakest part, but sufficient. Carpel definition is perfunctory and lacking references. In total, I believe the authors can correctly claim they have described an early angiosperm from the Jurassic. This paper should be published after revisions. 1) The authors interpret the fossil as angiosperms because the "ovarian roof has no any opening" and contained "seeds" inside. However, Figures 6F 4A, 4D and I, 5C show "seeds" exposed clearly in the center, so are the openings natural (that means the "receptacle/ovary" is never closed) or the openings are the broken rims of the style bases in the center of ovarian roof. If it is the former, the plant should be a gymnosperm. If it is the latter case, the nature of the "style" should be further examined. In Figure 6B in the center of the "ovarian roof", could the two obviously arching structures be the "style" base that extended upwards into the hollow lower part of "style" as showing in Figure 6A? If so, then could the "style" be a tubular structure extending outwards, like the protruding micropyle of gnetophytes? Since neither dendroid style is found in living angiosperms, nor a dendroid micropyle is found in gnetophytes, more detailed work is needed to reveal its nature. Suggestion: make serial sections on some specimen (e.g., the one in Figure 2H) to reveal the real/3D connection between the "dendroid style" and the "ovarian roof." 2) Figure 2F shows another opening with two "seeds" exposed in the edge in the top area, and this opening seems to be natural too. Could it suggest the plant of gymnosperms? Authors really need to demonstrate the nature of this opening. Also interestingly, the two exposed "seeds" in Figure 6H exhibit different colored zones. Are they real seeds or leaf modifications with veins, such as bracteoles? Figure 6G shows a seed with two horizontal groves. How to interpret the "groves"? Suggestion: apply fluorescent microscopy to examine the "seeds", to see if new evidence can be found. 3) The most bizarre structure is the "dendroid style". How many "flowers" have it? If it is a style, the end of each branch should be a stigma. Even if pollen germinated pollen tubes, the pollen wall could still be attached onto the stigmas. Suggestion: use fluorescence microscope and SEM to scan over those branch ends to make sure they are real fossil stigma with pollen. 4) The "stamen" presented in Figure 7J-K is not so convincing so that even the authors call it "possible stamen". Suggestion: make serial sections of specimens of flower buds to figure out the real shape of the stamen and find out more in situ pollen. It will be very significant if the pollen type matches up with those found on the "stigma". 5) The "bracts", "scales", "sepals", and "petals" appear all similar (Figure 5I), including cellular structures (Figure 10), except for size. Even the authors use "b" for a scale in Figure 2I. Could they be all bracts and bracteoles like those on the cones of gnetophytes? How to distinguish them from each other? The principal goal of this manuscript is to describe and present a new fossil taxon Nanjinganthus dendrostyla, an angiosperm from Early Jurassic South Xiangshan Fm. that outcrops in China. This new proposed taxon is based on "284 individual flowers on 28 slabs preserved in various orientations and states". They specimens are impressions/compressions. I have major concerns about the interpretation of these fossils and the inclusions of such interpretations within the diagnosis. Unfortunately, I have to disagree with the opinion of the authors that the fossils are well-preserved; the fossils are indeed poorly preserved (the authors even need to add lines on the fossil photos to show "organs" and characters). They placed this proposed taxon within the flowering plants based on their interpretation of structures that the authors claim they are observing. This is clear in the diagnosis (which it is basically a description and not a diagnosis). The diagnosis, description, treatment, Discussion and conclusions are not consistent with the evidence presented in the figures. These fossils can easily be conifer shoots preserved in different positions (the comparisons and Table 1 presented in the subsection “Eliminating Alternative Interpretations” are extremely vague) for example the cuticular characters of the "petals" are typical of conifers. Thank you for submitting your article "Nanjinganthus: An Unexpected Flower from the Jurassic of China" for consideration by eLife. Your article has been reviewed by two peer reviewers, including David Taylor as the Reviewing Editor and Reviewer #1, and the evaluation has been overseen by Ian Baldwin as the Senior Editor. The following individual involved in review of your submission has also agreed to reveal their identity: Hongqi Li (Reviewer #2). After discussion between the reviewers we do have two more important suggestions. We decided it would be good to keep the description of the unattached potential stamen, but we strongly suggest that in the text and the legend for Figure 3GH it explicitly explains the relationship of the organ and the associated flower (that they are not attached). In addition, the holotype is not a rock block but an individual fossil. You need to pick one fossil with sufficient detail as the type specimen. These editorial suggestions are meant to help improve the scientific impact by increasing the scientific accuracy of your text, but also to help you find a more neutral tone with which to present these revolutionary findings. Your work will surely stir up the community, and it's best to remain as "evidence based" as possible in the presentation of your work. Whether or not an angiosperm, this is a unique fossil species and should be published. The strengths are the figures, captions and descriptions. This discussion of relationship to other Jurassic plants is good, as in general the discussion of the organs. I would publish this with very minor corrections. Zeng et al., 2014 is not referenced. Holotype. The holotype is not a rock block but of an individual fossil. You need to pick one fossil with sufficient detail as the type specimen. 1) Insert "Noncarpellate Epigynous" between "Unexpected" and "Flower" in the title, because noncarpellate flower is more significant than its occurrence in Jurassic in my opinion, and epigynous flower is also very important. So, the "Unexpected" refers to the three aspects, and will attract more attention from not only paleobotanists but also modern botanists. 2) Therefore, "Noncarpellate Epigynous" should be emphasized more in the Discussion! For the part "This discrepancy suggests either.…. reassessed", I would recommend to adopt the style of Sattler and Lacrois's statement, "With regard to the evolution of basal placentation in Basella and other taxa of Angiosperms three possibilities exist: 1) It is derived from the carpellate condition, 2) It is primitive and the carpellate condition is derived, 3) Both carpellate and noncarpellate organizations have coexisted during the evolution of Angiosperms which may have been monophyletic or polyphyletic". And Nanjinganthus supports their second possibility! The three aspects and their implications should also be mentioned again in the Conclusion. 3) Since the "possible stamen" is not connected to any flower, please remove any related part thoroughly, even from "remarks", Figures, and the reconstruction drawing. Introducing this un-connected "possible stamen" will only weaken the credibility of whole paper! Thank you for resubmitting your work entitled "An Unexpected Noncarpellate Epigynous Flower from the Jurassic of China" for further consideration at eLife. Your revised article has been favorably evaluated by Ian Baldwin (Senior Editor), and a Reviewing Editor. 1) That the authors temper their conclusion that their data demonstrates that this is an early Angiosperm flower. 2) That the authors make sure the U-Pb analyses are explained in Materials and methods, and the results are properly presented. 3) An important source for confirming the age comes from the pollen assemblage. But there is no reference to a comparison from the literature. That the authors provide references and a brief discussion how your assemblage is similar, or a temporal range chart of the palynomorphs and a brief discussion why it supports the age. Here, we document a Jurassic angiosperm flower based on more than two hundred specimens of flowers preserved in various states from the Early Jurassic of Nanjing, Jiangsu, China. For the first time, there are abundant enough Jurassic flowers with features characteristic of angiosperm. This discovery refutes a 57-year-old doctrine, topples the current belief about evolutionary history and systematics of angiosperm, because this fossil significantly extends the history of angiosperms. This version is the result of modification after the suggestions from the editorial office and experts. The major changes include our addressing the concerns from the reviewers, and we have provided detailed point-to-point answers to their questions. In addition, more detailed supporting information is provided in our supplementary material. Thanks. We have corrected these mistakes. We have provided the definitions and demarcations for the terms we used, and marked them in the reconstruction. We have adjusted the figures and cross-referred each other. We have added this information for every figure. 5) Is the carpel closed? We have not seen typical carpels in classical sense in the specimens, so we do not know whether there are carpels in the classical sense in Nanjinganthus. So we cannot answer this question. The evidence of closed ovary, explanation why those appearing open are to be excluded, such as due to preservation. Must discuss those case figures where it looks open. We have added discussion addressing this concern. Intact ovarian roof is seen only in Figures 4C, 5H (probably plus Figures 7E-G). The open-appearing ovary is due to preservation. The best demonstration of closed is the Figure 7A-C series, showing organic connection of "dendroid style". Figure 2H also appears to show it. 3I does say that it is broken. What about 4C and 5H? This is intact, so no ovules/seeds are visible because they are eclipsed. 6) What is the branched "dendroid style" structure? Must exclude other possibilities. We have addressed this concern. The appearance makes it look like some male cones in conifers, but this possibility has been eliminated in our Discussion, due to lacking pollen grains (which are more likely than all other parts to be preserved in fossils) and penetrating cone axis. Also, any cases of flowers with "dendroid style" also with seeds? E.g., "dendroid style" is quite similar to a mature pollen cone of Taxus (no mention of this in the manuscript). We have discussed and eliminated this possibility. Need more on description. You only mention Figure 4 specimen with the "dendroid style": Flower 1 in Figure 1D shown in Figure 2H; Flower 2 in Figure 1D shown in Figure 2I, Figure 3A-C; Flower 10 in Figure 1E shown in 5GF, 6A-C; PB22282 shown in Figure 7A-B. It has been seen on 4 slabs for 10 times. It is weird, but based on those flowers, it is always centrally placed, has a naked portion at base, it projects past the bracteoid structures and connects in the same line, and first branches opposite to subopposite. It does not seem to project below the line between the attachment of the last bracteiod structures "petals". Could they be germinating seeds? Taking all information into consideration, we think the dendroid style is a structure that is inserted on the center of the ovarian roof and has little to do with the seeds inside ovary. 7) Are the sterile organs bracts/scales or perianth organs? We think this is possible. There might be a transition from one category to another. Their difference is likely hinged with their position in the flower. Are the "ribs" really veins, and are they clearly different in each organ? We think they are veins, judged basing on transmission light microscopy and stereomicroscopy. They are not obvious in bracts and scales. Also, these seem to have a 2/5 phylotaxy, not a simple spiral. Our observation does not allow us to make any statement about this. We have accepted this suggestion and are not talking about possible bisexuality in the newer version. The stamen is also removed from the reconstruction. The pollen and stamen are rare, tentative, sparse evidence now. We wish to refrain us from making bold statements. We wish there are. But current situation does not allow us to do so. Considering the early Jurassic age, it would be very suspicious if it could be directly related to any known angiosperms. The possibility of a gymnosperm with enclosed ovules has been a candidate in our mind. However, according to the current consensus, there is no gymnosperm with enclosed ovules yet (although there are indeed seeds protected in various ways). Thanks. We have modified our manuscript with this in mind. Thanks. The strata have been investigated for a long time. So far there is no controversy on the age yet. Various evidence seems to agree on the Early Jurassic age. We cannot fully agree with this, although we think this is a rational expectation. Before talking about “consistent with hypothesis”, the first question is “which hypothesis”? And why that theory? All currently available hypotheses are not justified enough to be such an ideal hypothesis yet. The second question is “Is this hypothesis reliable, believable, supported by fossil evidence?” In our eyes, there is none. It is completely possible that the hypothesis is simply taken for granted, based on no fossil evidence. Our fossils do not fit in any seek-images of ancestral angiosperms. This is not our fault or our fossils’ fault. It is the fault of the so-called “theories”, which do not reflect the reality. This is the part of botany that should be changed, not our fossils. Our fossils are not the only case refuting the “theories”, for example, Archaefructus from the Early Cretaceous does not look like Magnolia or Amborella at all. So please forgive our fossils from not fitting in the “theoretical expectation”. We believe, if the theory is correct, our fossils will definitely fit in its expectation. Nanjinganthus falls within the scope of the expectation of the Unifying Theory advanced by Wang (2010, 2018). Thanks. We have double checked the figure referring in the newer version. Thanks. We have added this statement. The carpel, at least in the classical sense, is not a term that can be applied universally in angiosperms. Some botanists have refuted the term of “carpel”, although we do not. However, we have given some references about this in the newer version. 1) The authors interpret the fossil as angiosperms because the "ovarian roof has no any opening" and contained "seeds" inside. However, Figures 6F 4A, 4D and I, 5C show "seeds" exposed clearly in the center, so are the openings natural (that means the "receptacle/ovary" is never closed) or the openings are the broken rims of the style bases in the center of ovarian roof. This breaking is not original, not natural. It is rather preservation artifacts. The intact ovarian roof is seen only in Figures 4C and 5H, in which case no ovules or seeds are seen, implying the ovules and seeds are fully enclosed. Style base and ovarian roof are the same thing, because the style is located on the top of the ovarian roof. It is impossible to distinguish these two from each other in Nanjinganthus. If it is the former, the plant should be a gymnosperm. If it is the latter case, the nature of the "style" should be further examined. In Figure 6B in the center of the "ovarian roof", could the two obviously arching structures be the "style" base that extended upwards into the hollow lower part of "style" as showing in Figure 6A? If so, then could the "style" be a tubular structure extending outwards, like the protruding micropyle of gnetophytes? This alternative does not exist. If this is correct, then the logical inference is that all organs including scales, sepals, petals are borne on the style. This is never seen in any plant including Gnetales. Since neither dendroid style is found in living angiosperms, nor a dendroid micropyle is found in gnetophytes, more detailed work is needed to reveal its nature. Dendroid (branched) style has been seen in Poaceae and Malvaceae. However, it is premature to correlate Nanjinganthus directly with Poaceae and Malvaceae based on this single feature. Suggestion: make serial sections on some specimen (e.g., the one in Figure 2H) to reveal the real/3D connection between the "dendroid style" and the "ovarian roof." Thanks for the suggestion. Current technology does not allow us to do serial sectioning. We have removed some material from Figure 2H for SEM observation, through which the stoma in Figure 8H is seen, and we did not see any possibility of 3D configuration of the ovary to be visualized. However, the connection between the style and ovarian roof have been clearly seen in Figures 3B, 6A, C, 7A-C. No better demonstration could be possible. 2) Figure 2F shows another opening with two "seeds" exposed in the edge in the top area, and this opening seems to be natural too. It is only a result of natural breaking. Could it suggest the plant of gymnosperms? No. The original status of the “seeds” cannot be visualized when it is not broken or altered. The original status can be seen in Figures 4C, 5H. Figure 2F cannot stand for the original status, just as broken pieces of a glass cannot represent an intact glass. Authors really need to demonstrate the nature of this opening. We have addressed this concern in the newer version. Breaking is not an opening. Also interestingly, the two exposed "seeds" in Figure 6H exhibit different colored zones. Are they real seeds or leaf modifications with veins, such as bracteoles? We have never seen any bracteoles like these and in this position. If you still insisted on this, we wish you could share related reference. Figure 6G shows a seed with two horizontal groves. How to interpret the "groves"? We cannot confirm the so-called groves in this case and we have no plausible explanation for this. This is the only case in over hundred specimens. More consistent occurrences will make robust interpretation possible and necessary. Suggestion: apply fluorescent microscopy to examine the "seeds", to see if new evidence can be found. Thanks. We have performed fluorescent microscopic observation and have found no meaningful information, either of pollen grains or of seeds. Thanks. We have performed fluorescent microscopic and SEM observations and have seen no trace of pollen grains. We have downplayed the information of stamen, due to singular observation and lack of significant information. We prefer to leave this for future study. It is expected that these from the same plant share a certain similarity in cuticle with each other. We have given detailed explanation in the newer version about the difference among these four foliar parts. We have no idea how this is related to those in Gnetalean cones (of Ephedra, Welwitschia, or Gnetum?). 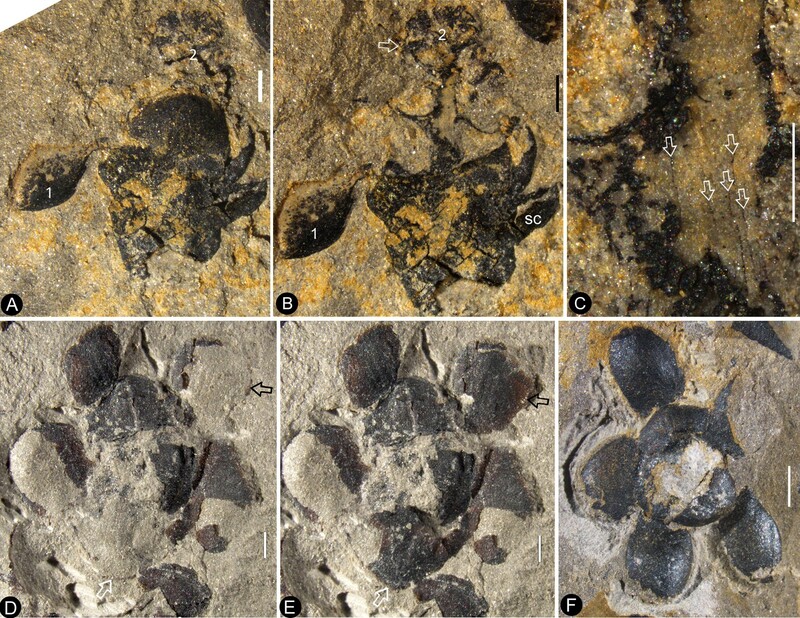 The principal goal of this manuscript is to describe and present a new fossil taxon Nanjinganthusdendrostyla, an angiosperm from Early Jurassic South Xiangshan Fm. that outcrops in China. This new proposed taxon is based on "284 individual flowers on 28 slabs preserved in various orientations and states". They specimens are impressions/compressions. I have major concerns about the interpretation of these fossils and the inclusions of such interpretations within the diagnosis. 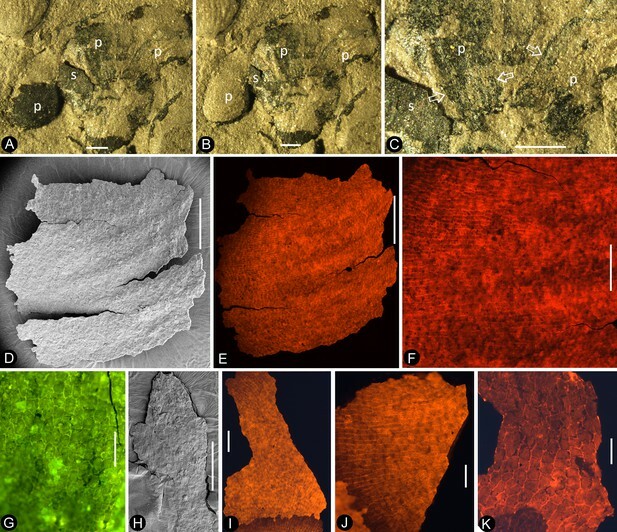 Unfortunately, I have to disagree with the opinion of the authors that the fossils are well-preserved; the fossils are indeed poorly preserved (the authors even need to add lines on the fossil photos to show "organs" and characters). They placed this proposed taxon within the flowering plants based on their interpretation of structures that the authors claim they are observing. This is clear in the diagnosis (which it is basically a description and not a diagnosis). Thanks. We assume you are saying that our description is consistent with diagnosis. The diagnosis, description, treatment, Discussion and conclusions are not consistent with the evidence presented in the figures. Which part is not consistent? Please be specific so we can correct these mistakes. These fossils can easily be conifer shoots preserved in different positions (the comparisons and Table 1 presented in the subsection “Eliminating Alternative Interpretations” are extremely vague) for example the cuticular characters of the "petals" are typical of conifers. The cuticular characters in Figure 9 show elongated epidermal cells in files, and simple pits that we interpret to be isolated stomatal complexes. Far from being “typical of conifers” this combinations of features is found across a very wide range of plant groups, from various gymnosperms and angiosperms. There is nothing about them which would suggest conifer above any other group. If the reviewer insisted on this point, we would love to see the reviewer sharing reference about this and we will address this point specifically. After discussion between the reviewers we do have two more important suggestions. We decided it would be good to keep the description of the unattached potential stamen, but we strongly suggest that in the text and the legend for Figure 3GH it explicitly explains the relationship of the organ and the associated flower (that they are not attached). Yes, we agree with this point and have deleted the related information throughout. In addition, the holotype is not a rock block but an individual fossil. You need to pick one fossil with sufficient detail as the type specimen. Yes, we have designated the holotype and isotypes. This now is among the references. Yes, this suggestion has been followed. We have adopted almost all the suggested changes except a couple places and we have added dating method information and references. For the Santos et al. reference, we provided DOI number. The Figure 11 in the preceding version was short of a line for 5. In the newer version, this line is added, therefore I have also replaced Figure 11. We hope this version can be acceptable now. We thank Ms Huijun Ma, Brandon Y. Wang, and Mingzhi Fu for their help collecting the valuable specimens, Ms. Chunzhao Wang for help with SEM during this research, and Dr. Walter Judd at the University of Florida for comments and suggestions. This research was supported by the Strategic Priority Research Program of Chinese Academy of Sciences (Grant No. XDB26000000), the National Natural Science Foundation of China (41688103, 91514302, 41572046) awarded to XW. This is a contribution to UNESCO IGCP632. We declare no competing interests. We appreciate the kind and constructive helps from Dr. David Taylor, Hongqi Li, Ian Baldwin and an anonymous reviewer, who made our manuscript much improved. Listen to Xin Wang explain how flowers may be much older than previously thought. Fossils found in China suggest that the first flowers emerged much earlier than previously thought.